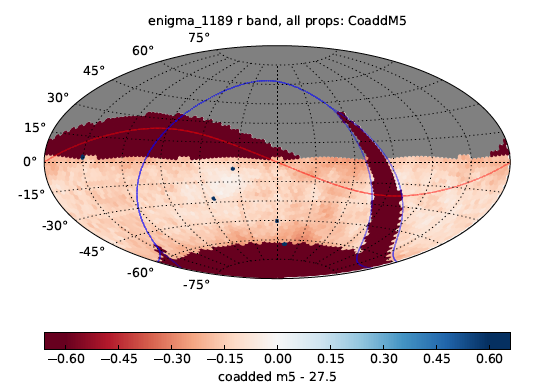 A sky map of the coadded depth in the r band after 10 years of simulated observations. The Metrics Analysis Framework (MAF) is an open-source python framework developed to provide a user-friendly, customizable, easily-extensible set of tools for analyzing data sets. Its initial goal is to provide a tool to evaluate Operations Simulator (OpSim) simulated surveys to help understand the effects of telescope scheduling on survey performance, however, MAF can be applied to a much wider range of datasets. The building blocks of the framework are Metrics (algorithms to analyze a given quantity of data), Slicers (subdividing the overall data set into smaller data slices as relevant for each Metric ), and Database classes (to access the dataset and read data into memory). The science performance of the LSST will in part, be driven by how it observes the sky as characterized by the footprint and cadence of the survey. Efforts are currently underway to train astronomers in the tools available to simulate the properties of the LSST; to revisit the science drivers for various LSST programs with an eye towards optimization of the baseline observing cadence; and to develop metrics that might be used to quantify the science performance of the LSST as a function of its cadence. Examples where further cadence optimization is likely to yield tangible improvements in the LSST science include the coverage of the Galactic plane, characterization of supernovae light curves, the reduction of systematics through dithering, deep drilling fields, and active area vs. sampling rate tradeoffs (also known as “rolling cadence”). For more details of MAF or if you have questions, they can be addressed using community.lsst.org.